Performers include: S. Epatha Merkerson, Sam Waterston, Jerry Orbach, Steven Hill, Jesse L. Martin, Leslie Hendrix, Fred Dalton Thompson, Chris Noth, Benjamin Bratt, Michael Moriarty, Elisabeth Röhm, Angie Harmon, Dann Florek, Richard Brooks, Carolyn McCormick, Jill Hennessy, John Fiore, Carey Lowell, Alana De La Garza, Dianne Wiest, Dennis Farina, J.K. Simmons, Annie Parisse, Paul Sorvino, Jeremy Sisto, David Lipman, Linus Roache, John Cariani, and Steven Zirnkilton. A long-running procedural crime drama that focuses primarily on the legal cases, rather than regular characters’ personal lives. Each episode is typically split between a criminal investigation and the trial that follows. 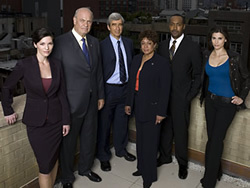 Police detectives include Lennie Briscoe (Jerry Orbach), Joe Fontana (Dennis Farina), Ed Green (Jesse L. Martin), Mike Logan (Chris Noth), Rey Curtis (Benjamin Bratt), Nina Cassady (Milena Govich), and Cyrus Lupo (Jeremy Sisto). Police lieutenants are Don Cragen (Dann Florek) and later, Anita Van Buren (S. Epatha Merkerson). From the district attorney office are Adam Schiff (Steven Hill), Nora Lewin (Dianne Wiest), Arthur Branch (Fred Thompson), Jack McCoy (Sam Waterston), Ben Stone (Michael Moriarty), and Michael Cutter (Linus Roache). Law & Order: NBC to Renew Show for Historic Season 21? I can’t believe they are canceling this show. I watch every Law & Order there is. I hope they change their minds. love the show still watch the repeats!!!!!! If Jay Leno gets L&O cancelled, I will NEVER watch NBC again!